Transform your iPad, iPhone or iPod touch into a portable DJ rig. 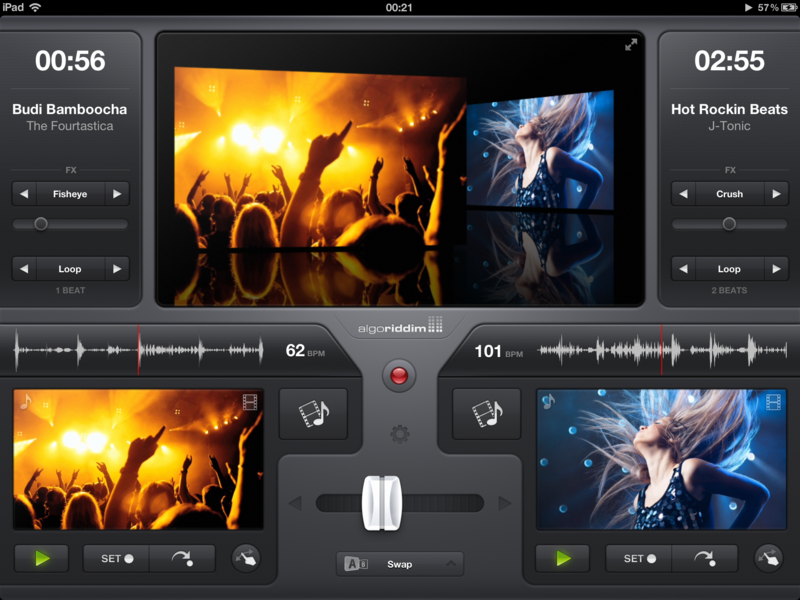 iDJ Live is the easiest way to become a DJ with your iPod touch, iPhone or iPad. This iOS-DJ controller is perfect for music lovers who have never tried DJing before. The iDJ Live system harnesses the processing power of your iPad, iPod or iPhone and enables you to DJ parties using the music that is already on your iPod via Algoriddim's djay for iPad app and other Core MIDI-enabled apps. Numark has worked with Algoriddim the makers of the highly popular djay app to bring support for iDJ Live to djay for iPad. Mix your iPod music library on a hyper-realistic turntable interface. Perform live, record mixes on-the-go, or enable Automix mode and let djay mix your favorite playlist automatically. With unprecedented ease-of-use and innovative multi-touch mixing features, djay for iPad takes DJing to the next level and offers a unique experience for beginners and professionals alike. djay is available for purchase from the App Store. For more information please click here. Algoriddim’s video-mixing app, vjay, also works seamlessly with iDJ Live to give you an incredible video and music mixing experience. You'll be able to interact with videos in a whole new way using real-time video transitions, audiovisual effects, and realtime VideoScratch™. vjay is fully integrated with iTunes, so you can preview, purchase and download new music videos instantly. Create an interactive audiovisual experience by combining songs from your music library with personal video footage. Or use your iPad's built-in camera to create your very own music video live. vjay lets you get creative with your content, display directly to a TV, stream wirelessly via Apple TV, or record your performances live to share on your favorite social channels. You can mix and scratch your music, including your iTunes music libraries using two large performance platters and a central mixer section with a crossfader, buttons and knobs. iDJ Live is laid out to carefully recreate the two-decks-and-a-mixer setup that professional DJs prefer. Just load your tracks to either Deck A or Deck B, and then control it, cueing up the start point, performing advanced transitions and even scratching. iDJ Live comes complete with an iPad stand and custom headphone/speaker audio cable so connecting to your sound system of choice is easy. Connect your iPod touch, iPhone or iPad in seconds using the built-in dock connector. Once these two connections are made, just switch the party into overdrive. Get mixing on your iPad, iPhone or iPod with iDJ Live from Numark. iTunes, iPhone, iPod touch and iPad are trademarks of Apple, Inc. registered in the U.S. and other countries. djay and vjay are registered trademarks of Algoriddim GmbH. 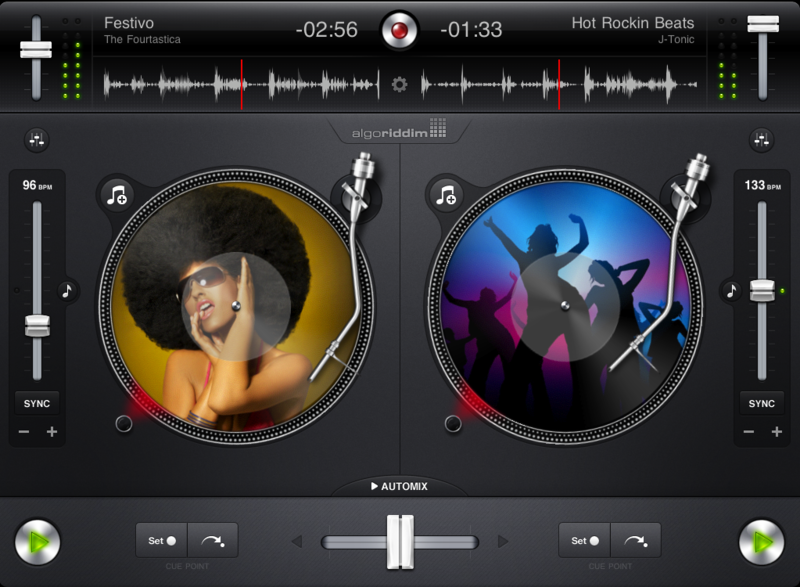 Software shown is Algoriddim's djay and vjay for iPad, available from the App store. Can I setup a separate headphone CUE in the djap app for iPad or iPhone? What battery life or performance time can I expect when using the iDJ Live controller with my iPad? The iDJ Live draws its power from the connected iPad, iPod touch, or iPhone. The power consumption of the iDJ Live is quite low. After following these recommendations, we have found that you can get up to six hours of performance time with an iPad 2 and three hours with an iPad 1.